One of the small recurring themes running through the post-financial crisis bull market has been whether we are experiencing a new technology bubble to rival the dot-com era. As a line of thinking this has basically been fuelled by two components. The first is simply that financial media love making comparisons like this to fill page space, and the second is that the dual trends of low interest rates and huge technological developments have fuelled speculative investments in some areas of the technology sector. A stock like Netflix for example was at one point worth the same as Kellogg Company, Campbell Soup and chocolate company Lindt & Spüngli combined. Respective profits for last year? $1.6bn for the food trio compared to around $0.1bn for the online streaming service. A similar story has unfolded in the privately held space where you’ve got companies like taxi app Uber being valued at $50bn+ as well. The thing that separates this technology cycle from the dot-com bubble though is the sheer weight of profits being generated at the top end. Back in the first quarter of 2000, right before the dot-com bubble burst, the three largest tech companies by market capitalization were Microsoft, Cisco and Intel. On a combined basis their market value was $1.5tn and between them their net profits for that financial year came out to a total of around $22bn. In other words if you constructed a mini technology portfolio consisting of only those three stocks then its forward valuation would have been approximately 70x earnings back in early 2000. Needless to say that at those kind of valuations it was almost impossible to see a scenario in which forward shareholder returns were going to be attractive. We discussed that with Cisco stock a few of days ago: it would have required earnings-per-share growth of 26% per year between 2000 and 2015 to deliver 7% a year capital appreciation, assuming the P/E ratio contracted to 15x earnings from the 175x it was at during the height of the dot-com bubble. Similar deal for Intel stock, and to a lesser extent Microsoft. That is what was so dangerous about investing in the technology companies during the dot-com bubble. Even if you managed to pick one of the good companies – those with high quality earnings and not disasters like Pets.com – the sheer extent of the contracting valuation multiples would have crushed your stock returns. As it turned out Cisco’s underlying business has done pretty good in the years since: earnings-per-share for example have grown by a compounded average of 12% per-year. Shareholder returns on the other hand have been absolutely dreadful. Likewise with Microsoft and Intel, although you’d have at least managed to scratch out positive returns with the former. Now let’s fast forward to the present day. The largest three technology stocks in the S&P 500 by market capitalization are currently Apple, Alphabet (formerly known as Google) and Microsoft. Their combined market value is around the $1.5tn mark and in fiscal year 2015 they earned about $90bn between them in normalised net income. In other words if you were to pick up those three stocks in equal measure you’d be looking at a price-to-earnings ratio of about 16.5. You can see that, on balance, the forward returns of that portfolio would likely significantly outperform anyone who was unfortunate enough to purchase equal chunks of Microsoft, Cisco and Intel stock at the peak of the dot-com bubble. You might not qualify the likes of Apple as a proper long-term holding because of the nature of technology sector, but there’s no doubt you’d be happier holding a three stock portfolio of Apple, Alphabet and Microsoft at 16.5x earnings for the next decade than you would’ve been holding Cisco, Intel and Microsoft at 70x earnings back in the spring of 2000. That’s pretty much been the defining difference between this tech cycle and the last. With the “old tech” stocks the profits are there to justify valuations. IBM for example is making $13bn a year on a market cap of $148bn. During the dot-com bubble Big Blue was going for around 25.5x annual earnings. 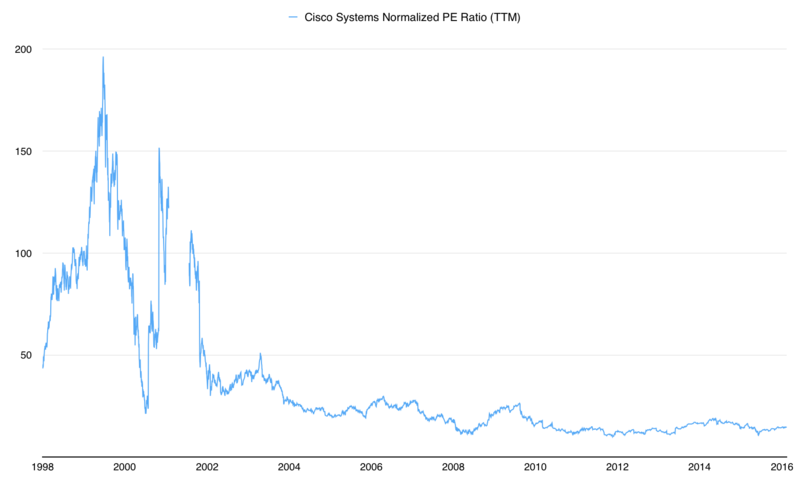 Cisco is currently trading at a prior year price-to earnings ratio of around 14.5 compared to the 175x earnings it was going for in the spring of 2000. Same deal with the various telecom giants as well. AT&T stock was trading at around 25x earnings during the dot-com era. Today you can pick up the shares for around 14.5x prior year’s earnings. Likewise Verizon at a current price-to-earnings ratio of 12.5x its 2015 earnings compared to 20x earnings in 1999/2000. Where you are seeing the bubble like valuations is in the private equity space and in the newer technology sectors like social media. Think Microsoft taking out LinkedIn for $26bn example – the equivalent of snapping up a long-term compounder like Hershey or Dr Pepper Snapple Group (with $10bn left over to play with after in the case of the latter). Think Amazon, whose market cap of $400bn is around 25% larger than that of Johnson & Johnson – a company which will earn somewhere in the region of $18bn in net income this year. Think Uber being valued in roughly the same region as alcohol brand giant Diageo despite having no discernible competitive advantages. You could just as easily add Netflix, Twitter, Tesla, Salesforce.com and probably a fair few others to the list too. Over the next couple of decades there’s a high degree of likelihood that those stocks will significantly underperform in terms of total return. Meanwhile the old tech stocks and their generally high quality profits are trading at respectable valuations. They wouldn’t be filling up your core portfolio positions as true blue-and-hold investments, but over a decade or so it’s not too difficult to imagine a scenario in which the likes of Alphabet, Microsoft and Apple stock deliver decent returns for their shareholders.